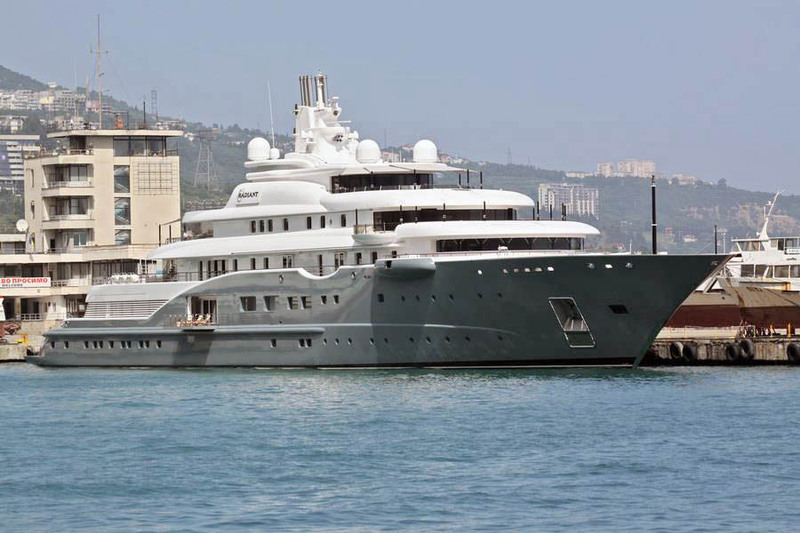 110-meter «Radiant» was built for Berezovsky, the prominent Russian oligarch. However, eventually it was sold to Abdullah Al Futtaim, auto dealer and owner of «Al Futtaim Group» (official dealer of Honda and Toyota in the UAE). According to Forbes the state of the investor is equal to $ 3.2 billion. Though the boat and the boat looks like a peaceful, far from it. «Radiant» is equipped with sound cannons and water cannons. It is an autonomous boat for a quick getaway. This ship of the same type as Dilbar was produced at the same shipyard. Both yachts are equal in length and have a similar design. Radiant was launched last year and is still little known to the general public. However, its majestic sludge did not escape the attention of photographers. The yacht, which has a steel hull and aluminum superstructures, was built taking into account the latest achievements of science and technology and in accordance with the requirements for environmental protection. The exterior was designed by Tim Heywood, interior design by Glen Pushelberg. The yacht belongs to businessman Abdullah Al-Futayim, whose family runs a large holding company in the United Arab Emirates for a variety of activities. The state of Abdullah Al-Futayim, standing on the 880th place in the list of the world’s richest people, is estimated at $ 1.1 billion.